Every Valentine’s day, my darling boyfriend takes the ladies of his life out for dinner. (Generally not actually the day OF Valentine’s Day, for numerous reasons… this actually occurred two weeks after the fact.) 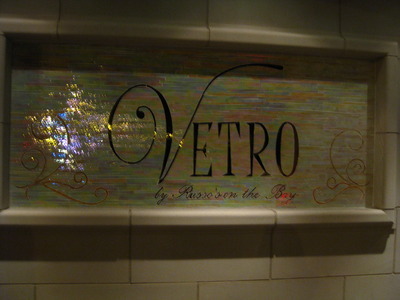 Recently, in his neighborhood had opened a place called Vetro, by the same people who own Russo’s on the Bay. I’ve spent many summer nights staring jealously into the back windows of Russo’s as people partied away; it is a very lovely catering hall where I’ve only had the good fortune of attending a wedding once… but it is a lovely space. (Ummm, the back of Russo’s is on the water; I stare into the back windows from across the water, I am not that creepy!) In any case, BF and Matriarch had heard such good things about Vetro that it was chosen easily for this year’s dinner, both for positive reviews and for proximity to their home. We were seated for our reservation pretty quickly, with very friendly service. Despite being in very distant Queens (BF will argue with you over Howard Beach being in the middle of nowhere, but this northern Queens girl will tell you every time- if only one train goes to your part of Queens, you are nowhere; I don’t care if the airport is right there! Also, if no one has heard of your neighborhood…), the service was top-notch and on par with many of the super fancy-pants places I’ve been. Actually… it reminded me of a catering hall staff, which shouldn’t surprise me. I’m sure they were trained by the same people who train the staff at Russo’s. Matriarch started off with the lobster cappucino. 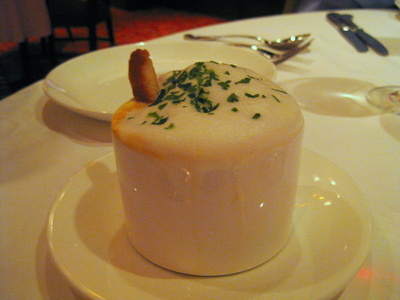 I know she really liked this, as she said so… and there was a LOT of lobster underneath that foam. She ate this very happily, telling us how good it was (and offering us, but BF doesn’t eat lobster, and I didn’t really feel in the mood). BF and I opted to share the antipasti caldo, which consisted of baked clams, eggplant rollatine, sausage and artichoke pie, and shrimp oregante (clockwise from top left). I gave both baked clams to BF cuz he liked them so much, plus he barely touched anything else on the plate! 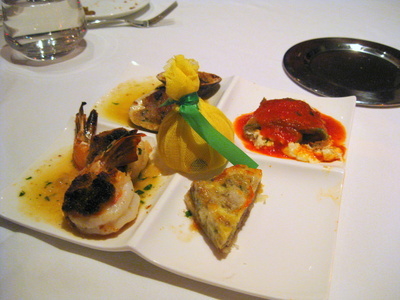 The eggplant rollatine was perfectly cooked, the shrimp very tasty (I shared with Matriarch, who loves seafood). The spinach/artichoke pie wasn’t quite what I expected, but wasn’t un-tasty… but a bit more artichoke would have been nice. 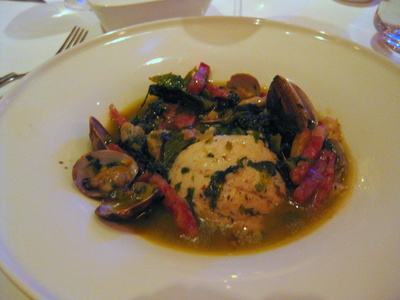 Matriarch ordered a fish special – crabmeat stuffed cod, with clams, and strips of what I want to call pancetta but am not entirely sure. I know she was super full after eating this, because there was a TON of food there. Point to note about the service: we were enjoying a leisurely paced meal, and at some point between the appetizers and this course, Matriarch stood up to use the restroom. Her plate arrived shortly after (the bathroom was very far away, so it took a while to walk to and from back to our table); our server, upon noticing this, took her plate back to the kitchen to keep it warm while she was away, and brought it back when he saw her returning from the restroom. 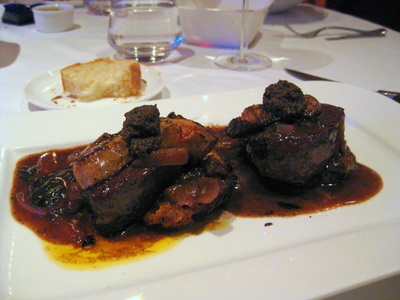 BF’s choice of one of the meat dishes with truffles and foie gras surprised me. I told him he might not like it as truffles are quite strong (I don’t actually appreciate truffles, to be honest), and foie gras, something I adore, is super fatty (and he hates fatty) but he wanted to try it and gave it a shot. Unsurprisingly, this proved too earthy for him, though he admitted he was happy he’d tried it and that the steak itself was extremely tender, so he enjoyed eating that… around the truffled bits. 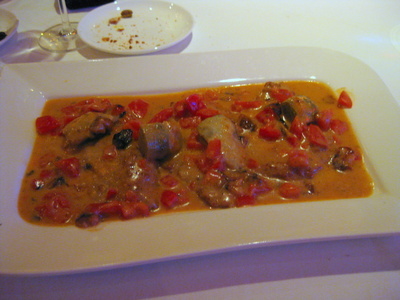 For me: scalloppine con carciofini; veal pounded thin with baby artichokes and plum tomatoes in a white wine cream sauce. Each piece meltingly tender, and the bright, fresh tomatoes punctuating each bite with heavenly cream sauce… mmm. I was surprised how much I enjoyed this – and how deliciously fresh/in-season the tomatoes tasted, considering this was February and not tomato season at all. I was a very happy camper indeed. 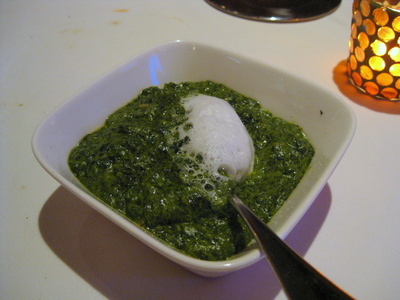 I also ordered a side of creamed spinach, just to add some veggies to the table for Matriarch and I. These were really good, but since then, I’ve made my own amazing creamed spinach and hesitate to laud this one too much. But they were quite delicious, and BF even took some and declared them very tasty. And last but not least, to cap off the evening, though we were all very full, we decided to split an opera trio. 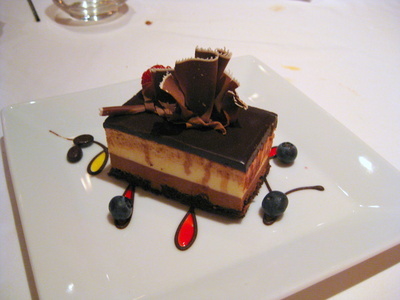 I don’t like dessert or sweets that much and generally take a bite to be polite, but I had 3 or 4 bites (before acquiescing to the BF), becuase this was pretty damn good. I don’t know if they made it in-house, but it wasn’t overwhelmingly sweet nor gooey. Yum! Also of note: Howard Beach is not a large neighborhood. Many if not most people know each other there. To that end, upon entering, BF and Matriarch both bumped into various people who knew them that worked there. Our server turned out to be one of BF’s friends from way back, who offered to buy us our after-dinner drinks (I declined because I had to drive and we’d already split a bottle of wine, a very lovely Riesling). The staff was super courteous to us, and I’m sure that they were all trained at Russo’s (which means they are well-trained on giving excellent service)… but I can’t say whether or not we were treated special because of the relationships some of the staff had with both BF and Matriarch. BF also very cutely revealed to our server that I am a food writer, which may or may not have played a part in everything as well (I’m more inclined to believe, if anything at all, it would be their relationships as opposed to that having an effect, since I’m no household name). Last: the place was still very new when we went, now slightly less so. The decor was lovely, and the place is ginormous – like a catering hall, since you can actually rent it for smaller weddings than Russo’s. And while I emphasize that the service was absolutely lovely, there were some new-place-glitches, such as an unfamiliarity with the wine list… and at that time, the cappucino machine was not quite up and running yet. But they went out of their way to find a suitable drink replacement for Matriarch, which was greatly appreciated. As I said, excellent service. Yvo says: All in all, a great experience. Quite yummy food, with outstanding service… though I can’t say it is destination dining, since it is quite far to travel from Manhattan, the food is solid and I would think a lovely place to host an event as well. The prices are about standard for a place of this level – for three of us with all of the above plus a bottle of wine with a generous tip… a little more than $200. I am full just reading this. It sounds like you had a lovely experience. That dessert looks wonderful, as does everything else. The food was great. i love this place. It’s also worth mentioning that the lounge area the have is BEAUTIFUL and you can order apps and drinks there too. It’s chic and comfortable at the same time. 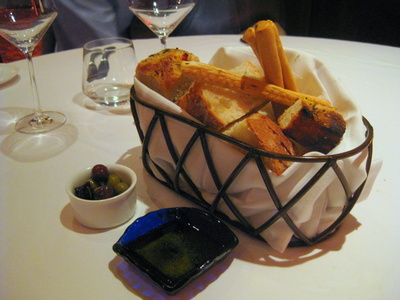 The food was incredible, the service was impeccable. It’s a most do. You leave this place with a smile on your face.